A gorgeous, two bedroom, two bath, non-smoking vacation rental condominium located in the gated resort community of PGA West. This home sits on the 15th tee of the world famous TPC Stadium Golf Course designed by Pete Dye. We have been renting our condo since 2003 and have positive responses from all those who have stayed previously. We even have one couple who has rented with us since 2003. They come all the way from Switzerland and stay for a month every year. The condo provides high speed Internet access with wired or wireless connections available. We also offer phone service with includes unlimited calling in the United States, Canada, Mexico, China, Hong Kong, India, and U.S. territories. The TPC Stadium Course is the current host course of the CareerBuilder Challenge (formerly the Humana Challenge) and will serve as the tournament's final round course. It has played host in the past to such events as The Skins Game, The Bob Hope Chrysler Classic, The Liberty Mutual Legends of Golf, and the PGA Grand Slam of Golf. 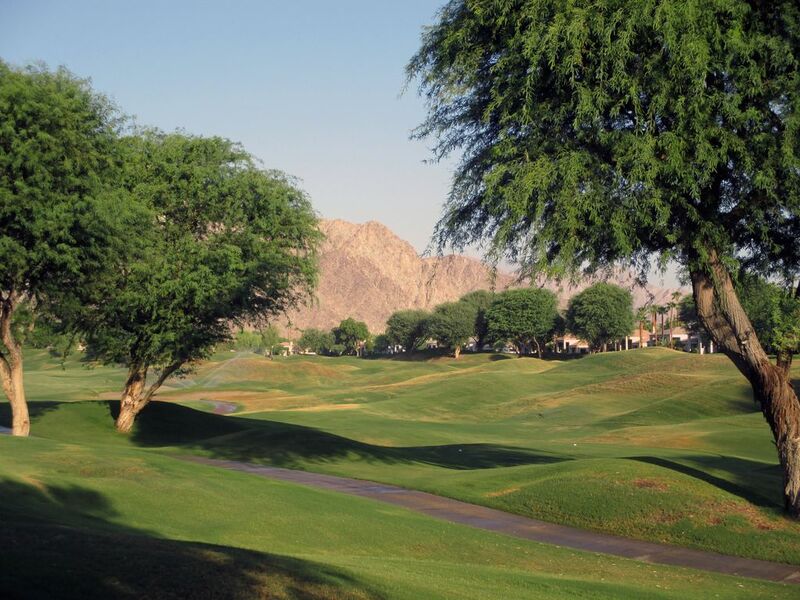 PGA West, better known as The Western Home of Golf, is host to six stunning golf courses, three of which are open to the public. You can sit on your patio which overlooks the course and is backdropped by gorgeous mountain views. The landscaping in this resort community is absolutely incredible. The home has recently been refurbished with new furniture, paint, and other amenities. It sleeps five with a king bed in the master bedroom, queen bed in the second bedroom, and an available roll-away bed for an extra guest. Wake up in the master bedroom and step from your bedroom to the patio to right on the golf course. Watch the hot air balloons soar overhead. The kitchen is fully stocked to prepare that morning breakfast on the patio or the elegant evening dinner. A gas barbecue grill is also available on the gated courtyard entry to the home. As you sit in the living room, you can relax by the fireplace on those cool desert evenings. A wet bar is also featured next to the fireplace. The home also comes with a full entertainment system located in the living room. Included is a large 47" flat panel TV with cable, Blu-ray DVD player and CD/Stereo system. Each bedroom also contains a 29" flat panel TV with cable. Your choice of two pools with spas are located just nearby. Just walk out the back patio and in a few steps (75 to be exact), you will be at one of the pools. This is everything you could ask in a place to stay. Just bring your clothes. Come and feel right at home. We hope you'll be able to stay with us soon! Our condo since on the 15th tee box of the world famous TPC Stadium Course designed by Pete Dye. Comfortable, spacious, well maintained condo. Could stay a few days or several weeks. Just a few minutes drive to groceries,restaurants,, etc. Owner responsive and easy to work with. Highly recommended. This property was everything we expected. It's location is excellent. It has everything you need. I highly recommend it! We had a wonderful time staying at this property. Bill was great to work with and the place was all in order awaiting guests! The location of the condo was perfect for walking or biking and swimming pools were a minutes walk away. We felt very safe there in the gated community. Restaurants and shopping were about a 10-20 minute drive. The view onto the golf course was just icing on the cake! The weather couldn't have been better. Thank you so much for your review. I'm glad you had a great stay and we hope you can come back again next year. We had a great time on our long weekend. The condo was very clean and comfortable, and had everything you needed in the kitchen. We enjoyed our mornings having coffee on the patio and watching the early morning golfers tee off on the 15th. Bill was great to work with and very accommodating. We will definitely come back. We have been coming to the Palm Springs area for many years and have stayed most of the time at PGA West. We like the Champion series condos, and this one is the best we have stayed in to date. The owner Bill is great to deal with, and responds quickly to inquiries. The location is excellent as it is facing north west and the golf course patio is always in the shade, making it comfortable to sit on the patio. The pools are close and since PGA heats the pools alternately by the month, one nearby is always heated. This condo has units on both sides of the street, which means the pools are closer to each unit on the block. The condo is clean and nicely furnished and decorated with quality furnishings. This condo has a bar sink and fireplace that most of the other condos did not have. There are lemon, orange and grapefruit trees nearby, and we enjoy the fresh fruit picked off the trees. The condo has a telephone with free long distance to the US and Canada, which allowed us to keep in touch with family back home. The kitchen is well stocked with dishes, but could use some pantry supplies like spices, and other items that are little used to make a short stay more enjoyable without leaving out ingredients from some dishes. The only suggestions we made to the owner were to realign the vertical blinds, which tend to get out of sync over time, and look at the internet connection, which seemed slow to us. We will come back again next year, and have already booked our time. 10% City Tax on all stays shorter than 30 days.